Steven Van Belleghem and Peter Hinssen share the learnings from their recent ‘inspiration journey’ around Silicon Valley. 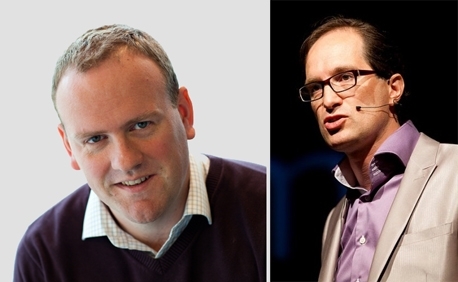 In mid-September 2013, we – that is Steven Van Belleghem and Peter Hinssen (pictured left to right) – organised an inspiration journey to the American West Coast. The goal of the trip was to gain a better insight into the method of working and entrepreneurship in Silicon Valley. In this post we’ve written down our conclusions and vision. There is a full paper available based on our visits to the following start-ups and big companies: Taco Bell, Quid, Salesforce.com, Google, Evernote, Apple, BlueKai, LinkedIn, Disney, Stanford, Yammer, Yahoo, Microsoft, Starbucks and Amazon. Our conclusions can be summed up in a few words since they are all based on the same principle: putting the customer first to an extreme degree. The customer is truly at the heart of the philosophy, and any form of compromise at the expense of the customer is out of the question. Successfully implementing this modern customer approach requires a flexible, networked organisation. Marketing, HR, IT and general management must share a network. The hierarchy can remain in place but doesn’t have to be respected. Keeping things moving, making real-time decisions and continuously optimising the customer relationship are the goals shared by every level of the organisation. And finally, the network needs a purpose-driven culture to get everyone on the same page. Instead of talking about their products, Silicon Valley companies talk about how they are going to change the world. We will now examine each of these three steps in detail. This first post is about the first topic, in the next few days, we’ll elaborate on the other two. Successful companies reinvent the relationship with their customers. Modern organisations build a structure that truly puts the customer first: customer-centricity without compromise. For example, Evernote could make bigger short-term profits by charging their customers for downloading their app. However, they would never do this because they would reach fewer customers that way. LinkedIn could make lots of money by commercialising their network data but they’ll never do so. Customer-centricity without compromise means keeping the customer at the heart of things, even if this goes against the bottom line in the short term. The theme of our visit with Apple was their extreme focus on all details that impact the customer relationship. Apple wants to surprise its customers and exceed their expectations. They do this not just through the next disruptive innovation but also by optimising the existing customer relationship. Yahoo, a company in a major turnaround, wants to improve the consumers’ daily habits. The Yahoo weather app (winner of a 2013 Apple Design Award) is a case in point. There are many weather apps but Yahoo displays stunning photographs of the featured cities and has created a very user-friendly interface. The philosophy to surprise the customer in every detail has brought about a change in the organisation’s culture. If it’s not good enough, it’s not put on the market. New products should be released faster. The trick is to work with short feedback loops and improve products in real time. Traditional companies conduct months of market research prior to releasing a new product. After the launch, the product has to remain viable, even if the objectives are not met. In other words, subsequent to the launch, all they do is wait and tweak the marketing strategy from time to time. The new model shortens the time to market for new products. Those products are improved very rapidly thanks to real-time feedback from staff and social media. Modern product launches are an iterative process, thereby turning the launch into the start of a new process. We heard about restaurants that change their menus and instantly know what customers think thanks to the feedback they give the staff. This information is shared internally via Yammer, an internal collaboration tool. Shortly afterwards, the product is updated. Products that are not up to standard are immediately discontinued. Big data is the buzz word right now. All companies use data to enhance the customer relationship. Modern technology allows us to focus on the desires of individual customers and not just those of the average customer. Big data predicts what a customer wants before the customer himself is aware of his desires. Instead of real-time solutions we are now looking at “before time” solutions. Companies can offer their customers today what they will need tomorrow. For instance, Taco Bell uses big data to predict the success of product launches. They can tell with 90% accuracy how successful or unsuccessful a new product will be. Data is the marketing department’s new secret weapon. Data can not only be used to predict the chances of success but also to make the right message appear at the right time. Evernote, a free app to create notes and record voice memos, is convincing consumers to switch to their paying version by presenting commercial messages in the appropriate context. Nowadays a modern marketer looks for ways of using data to boost his sales figures. Nike’s Fuelband is another example of a big data tool. Users of this digital bracelet provide Nike with tons of free personal info. Nike knows where you are, how far you walk, how often you work out and what your heart rate is. In theory, Nike could have a new pair of trainers delivered to your doorstep at exactly the right time. It would be the ultimate proactive service a brand could offer its customers. Thanks to big data, companies know what you need before you do. Everyone knows Angry Birds, the most successful mobile game ever. The game’s success can be explained in three words: fast, easy and fun. The new challenge will be to make your relationship with the customer meet the Angry Birds rules. Do new applications have a short time to market? Are they easy and fun? It’s not an “or” question, it’s an “and” question. Consumers are accustomed to the ease of use of Apple and Google. Customers’ expectations usually evolve faster than a company is able to make changes. That is why it is necessary to subject every product launch or new online feature to the Angry Birds test. Davy Kestens, the founder of Twitspark, feels that investing in patents is a waste of energy. “They stand in the way of innovation. When faced with copycats we simply need to improve our products even faster”.